I am the happy winner of The Cook’s Country Cookbook and just couldn’t wait to make the award winning cake: Tunnel Of Fudge Cake for hubs birthday~it is a recipe that has been resurrected without using a cake mix. It’s a little more work, but well worth the chocolate results! Adding melted chocolate to the batter makes the cake more moist. 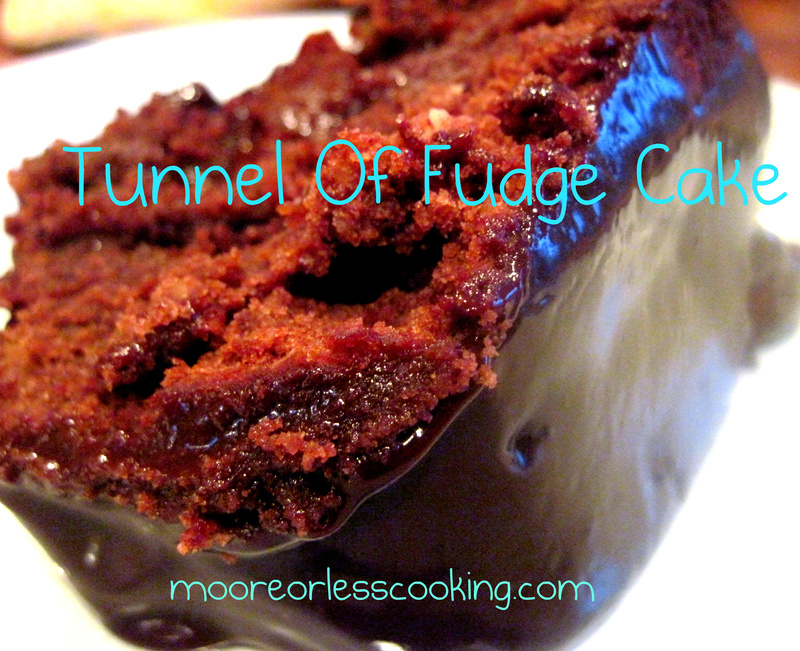 The cake is slightly underbaked which adds to the perfect consistency for the fudgy tunnel. To know when the cake is done, simply remove the cake from the oven when the sides of the cake pull away from the bundt pan. The cake will spring back when lightly pressed by a finger. 1. To prepare cake, adjust oven rack to lower-middle position and preheat oven to 350 degrees. Generously butter a 12-cup Bundt pan and dust with cocoa powder, tapping out excess. Place bittersweet chocolate in a small heatproof bowl. Add boiling water, whisk until smooth, cool to room temperature and reserve. 2. In a large bowl, whisk together cocoa, flour, walnuts (or pecans), powdered sugar and salt and reserve. 3. In a large measuring cup, whisk together eggs and vanilla extract and reserve. 4. In a large bowl, using an electric mixer on medium-high speed, beat sugar, brown sugar and butter until light and fluffy, about two minutes. Reduce speed to low, add egg mixture and mix until just combined, about 30 seconds. Add chocolate mixture and mix until just combined, about 30 seconds. Add flour mixture and mix until just combined. 5. Scrape batter into prepared pan, smooth batter with a rubber spatula and bake until edges are beginning to pull away from pan, about 45 minutes; do not overbake (do not use a cake tester, toothpick or skewer to test the cake). 6. Remove to a wire rack and cool, upright, for 1½ hours. Invert cake onto serving plate and cool completely, at least two hours. 7. To prepare glaze, place chocolate in a heatproof bowl. In a small saucepan over high heat, combine cream, sugar and water and bring to a boil. Pour liquid over chocolate and let sit for 30 seconds. Using a whisk or a rubber spatula, gently stir chocolate and cream together in small circles, starting at center of bowl and working your way out in increasingly larger concentric circles. 8. Leave glaze at room temperature until it thickens just enough to pour in a ribbon, about 20 minutes. Drizzle glaze over cake and let sit for at least 10 minutes before serving. Cover tightly and store at room temperature for up to two days. Congratulations, happy winner! You had me at adding melted chocolate to the batter. I’ve never tried one of those cakes that you underbake, I’m always afraid I’ll screw it up. But since I’m sitting here with my mouth watering, I guess I’ll have to try this one. This sounds like chocolate heaven! Pinning this! Thank you Sugar Cookies to Peter Bilts! Cooks Country is my favorite cooking. Show on pbs! Thanks for sharing, somrday I hope to be well enough to make one! I miss baking and sewing so much! I hope you enjoy this cake as much as we do! THE CAKE LOOKS YUMMY! I WILL TRY IT AFTER THISHOLIDAY IS OVER. THNAKS FOR THE RECIPE. I don’t see any baking powder in the list. Are you using cake flour? No baking powder and All purpose flour is used to make a fudge center for this cake.